He is the greatest hitter of his generation - a 14-time All-Star and a 7-time league MVP. But Barry Bonds' name has also frequently been associated with accusations of performance-enhancing drug abuse. Arguably, these rumors let to the end of his career with the Giants, last fall. Now the team has invited him to their 50th anniversary party. Barry Bonds hit more home runs than anybody in the history of Major League Baseball - averaging 44 HRs per season between 2001 and 2007. Then, last fall, with steroid accusations and perjury charges hanging over his head his employer, the SF Giants passed on a contract renewal. 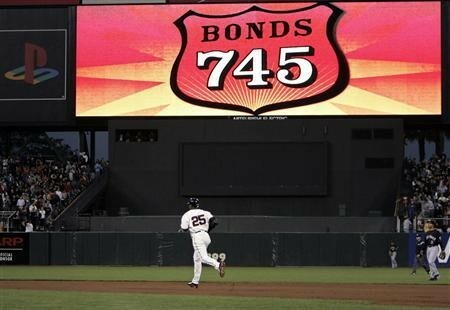 Now, Bonds who has not returned to the ballpark since the Giants let him go, has been invited by the team to join the festivities for their 50th anniversary in San Francisco this Saturday. Bond has yet to respond to the invitation and it remains to be seen if he will be around. Bonds steroids use has never been proven, and we certainly wish him the best of luck. According to Peter Gammons, sportswriter and National Baseball Hall of Fame honoree, Bonds saw about 7500 pitches between 2001 and 2004 - and swung and missed only about 200 of them. Now, if steroids can make you that impressive, clearly we would see a lot more performances like Barry's over the years. Fact is, we haven't. Just imagine steroids could make people hit home-runs like that - batting a ball over a wall 400 feet away, then this surely would be the end of sports as we know it. It is safe to say that steroids alone cannot make you a better player, you just cannot drug yourself into being an All-Star player. Of course, the Giants know that, too - and it was the right decision to pay him the respect he deserves for filling their stands with outstanding performances, year after year. 1 Speed Keeps MLB Players Speedy – The Rising Use of ADHD Drugs in Baseball.